Machu Picchu is without doubt the biggest tourist attraction to be found in Peru and one of the bigger ones in South America. Due to this popularity one would thing that buying entrance fees to see this New Wonder of the World would be straightforward but unfortunately as with many things in Peru it is not. Therefore following we will try to give you an overview of the options one has to obtain one of the daily 2500 tickets for Machu Picchu available. Since two years the number of visitors daily has been limited to 2500 and since last year this number is reached for some days, especially during the high season (June through September). In earlier times people bought their entrance ticket at the site itself as there were more than enough spaces available. Now with popularity increasing and the ticket office at the entrance closed, it is getting more and more important to buy these tickets in advance – after all, nobody wants to end up in Aguas Calientes after an expensive train journey only to find that there are no entrance tickets available anymore. So what are the options to buy these entrance tickets in advance? Here at www.howtotraveltomachupicchu.com we can provide you with entrance tickets to Machu Picchu as well as train tickets, guides and hotel reservations. Message us through the contact form and provide us with the dates, a color copy of your passport and email address and we can arrange these tickets for you. We will send you an online link for the payment which can be done either with Mastercard or Visa and once payment has been received will send you the tickets electronically. You can just print these out and you are ready to go. 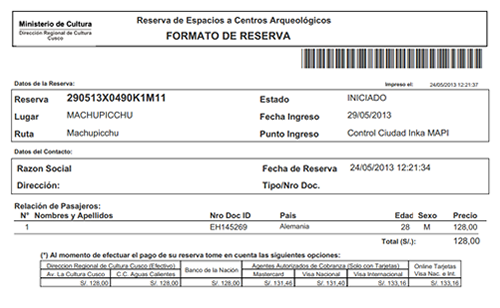 For people having a tick skin and a lot of patients, tickets can also be bought directly through the government website; The website recently is experiencing a lot of issues, especially with payments for the tickets but if you are lucky and reach the website on a good day you can buy your entrance tickets for Machu Picchu here. You go to the website, choose the ticket you are looking for (remember there are 4 different tickets available, for more information see; /travel-tips/new-entrance-fee-machu-picchu) and fill out your details. This will generate a reservation code. 1. You can pay for the ticket online via the website using a Visa credit card and print out your tickets. 2. You can pay for the reservation at any Banco de la Nacion in Peru. 3. You can for the reservation at the ticket office in Cusco or Aguas Calientes. PLEASE KEEP IN MIND THAT RESERVATIONS MADE ONLINE ON THE www.machupicchu.gob.pe WEBSITE ARE ONLY VALID FOR 6 HOURS AND IF NOT PAID FOR IN THIS TIME LAPSE WILL AUTOMATICALLY BE CANCELLED. 1) For Visa payments online you go (after having made the reservation) to the same website and go to the “pagos” option in the top menu bar. Here you fill out the reservation code you generated and continue to the payment page. This will take you to the “Verified by Visa” page for the payment of your tickets. Please be aware that due to a lot of time-outs on the page this may take a couple of tries to get through. Once the ticket is paid for you will return to the confirmation page were you can print out the entrance tickets. Note; please keep in mind that with these payments (especially in the high season) at the entrance of the site you can be requested for the Visa card used for the payment as well as a valid proof of identity with photo. 2) Banco de la Nacion; with the generated reservation code online, the reservation can also be paid for physically. Once the reservation is made a reservation document will pop up. This reservation document you will have to print out (or copy at least the amount and reservation number) and with this go to the Government bank; Banco de la Nacion. There is a Banco de La Nacion in almost any Peruvian city so you could do this during your trip and not necessarily in Cusco. Please keep in mind that due to the fact that these banks are used for a lot of bureaucratic payment the waiting times can easily be up to an hour. To make this payment you will also need to bring your passport or valid proof of identity as well as the reservation print out or code. Once the payment has been made you will be given a voucher for this payment and have to return to the official website and in the “check-in” section of the top menu fill out the original reservation code. If the payment came through you will hear have the possibility to print out your ticket(s). 3) With the reservation generated online you can also walk into the “Direccion Regional de Cultura” offices either in Cusco or Aguas Calientes and pay for the tickets physically. You would just need the reservation number and your passport. Here you can pay in cash or with Visa credit card and the tickets will be handed to you at this moment. Nevertheless as at these offices they can also make the reservation, it is not really necessary to use the website first if you are considering buying your tickets here. Av. Pachacutec (just off the main square). Monday – Sunday, 5.00am – 10.00pm. Finally you can buy your Machu Picchu entrance tickets at the Direccion Regional de Cultura offices either in Cusco or Aguas Calientes. You can just go to either of these offices with your passport and they accept payment either with Visa credit card or cash. The office in Cusco is located at about 15 minutes walking form the main square and in Aguas Calientes on the main road of town. Keep in mind that as there are only 2500 spaces available per day (especially in the high season), this option is best only used when having at least a week in advance. The tickets will be given you at this moment. The last option would be to contact an official travel agency and let them buy the tickets for you. In general agencies will need your passport information (full name, passport number, date of birth and nationality) and the tickets will have to be paid for in advance as agencies have to make full payment on the moment of purchase. On average agencies will charge a 10-15% commission on the ticket price but this percentage can go down if you would have them organize more services such as trains or hotel overnights. Therefore as you can read there are several options for buying your Machu Picchu tickets in advance but it has to be taken into consideration that the process for neither of these is very straight forward as the Direccion Regional de Cultura so far did not manage to create a simple and transparent system.Lastly it is important to keep the following in mind when buying your ticket; Machu Picchu tickets are non-transferable and non-refundable – therefore once you have bought the ticket and cannot go on the day you bought the ticket for this ticket will be lost completely and cannot be sold on to any other visitor – all tickets are personal and registered with passport numbers.